The Tokyo National Research Institute for Cultural Properties (TNRICP), has been conducting a joint study on intangible cultural heritage with the National Intangible Heritage Center of the Cultural Heritage Administration of the Republic of Korea. 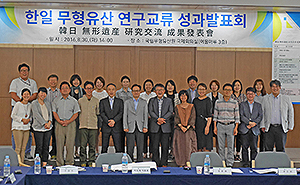 As a part of this project, the “presentation meeting of the results of the Japan-Korea research exchange on intangible cultural heritage” was held at the National Intangible Heritage Center located in Jeonju-si, Korea, on August 30th, where the results of the joint study were presented. Six persons, including mainly staff members of the Department of Intangible Cultural Heritage, attended the presentation meeting from the TNRICP. Representing the Institute, Researcher Riyo KIKUCHI gave a presentation titled “Japan-Korea Research Exchange (2012-2016) on Protection and Handing Down of Intangible Cultural Heritage,” which was followed by a proposition titled “Approach of the Future Study Exchange” presented by Hiromichi KUBOTA, Head of the Intangible Folk Cultural Properties Section. In response to the above, two presenters from the Korean side presented a report and a proposition. Subsequently, there was a comprehensive discussion by all the participants. Through the joint study, it has been clarified that there are some similarities and differences between Japan and Korea in terms of approaches to intangible cultural heritage. At the presentation meeting, it was decided as a policy that both parties would be able to exchange information concerning common problems and challenges and to promote discussion based on mutual understanding of these similarities and differences. For example, it was explained that Korea is now very interested in how to promote intangible cultural heritage and the major issue is how it can be supported by the public sector such as the National Intangible Heritage Center. On the other hand, today in Japan, although the involvement of the public sector in the field of intangible cultural heritage is not as notable as in Korea, we consider it one of the Institute’s missions to carry out studies that can contribute to cultural handing down and inheritance. In this regard, we believe that we will be able to devise a better approach for both the parties by addressing the common challenge of “how to hand down intangible cultural heritage” though the exchange of opinions and discussion on each possible approach. This should also be one of the merits of a joint study carried out between the two countries. It is our hope that, on the basis of the results of this presentation meeting, the research exchange between the two countries will be further accelerated, bringing about constructive discussion. Discussing plans to conserve and manage the ruins with a staff in charge from the National Government of the Federated States of Micronesia. The Ruins of Nan Madol in the Federated States of Micronesia were inscribed on the List of World Heritage (and simultaneously on the List of World Heritage in Danger) at the 40th session of the UNESCO World Heritage Committee held from July 10th to 17th, 2016. The ruins are composed of 95 man-made islands of various sizes built with gigantic stones such as basalt and are among the largest ruins of megalithic culture in the Pacific region. 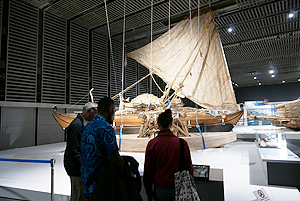 Inscription on the List of World Heritage had been a long-cherished dream of the island nation. 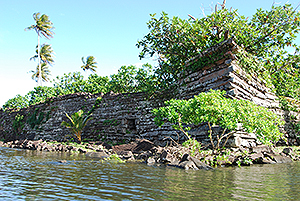 In 2010, the nation asked Japan to extend international cooperation in protecting these ruins through the UNESCO office for the Pacific region. 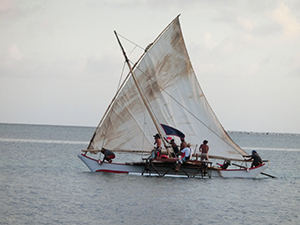 In response, the Japan Consortium for International Cooperation in Cultural Heritage (Consortium) conducted a field survey of the partner nation in February 2011 and published the findings in the “Survey Report on the Present State of Nan Madol, Federated States of Micronesia.” Since then, the Consortium, the National Research Institute for Cultural Properties, Tokyo (NRICPT) and the Nara National Research Institute for Cultural Properties have taken the initiative using subsidies from the Japan Foundation and other organizations in implementing projects to develop human resources and transfer technology to protect the ruins. 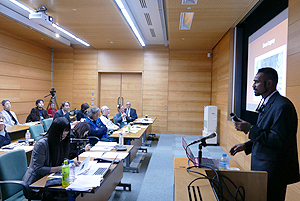 During the course of the implementation, we were able to secure the participation and cooperation of individuals, including Professor Osamu Kataoka of Kansai Gaidai University, who has studied the ruins over many years, and various organizations from governmental, industrial and academic sectors, such as the Institute of Industrial Science of The University of Tokyo, Forestry and Forest Products Research Institute, NPO Pacifika Renaissance, and Windy Network Corporation. One of the Consortium’s ideals is to build a common base for a broad range of domestic parties involved in the protection of cultural assets to join hands and work together, so that Japan may be able to work on international cooperation through concerted efforts. The project to provide the Ruins of Nan Madol with cooperation to protect them is the perfect showcase of this ideal. Moreover, the fruits of such effort most probably led to its inscription on the List of World Heritage. Having said so, however, the Ruins of Nan Madol were also simultaneously inscribed on the List of World Heritage in Danger. This means that many parts of the ruins have continued to collapse. 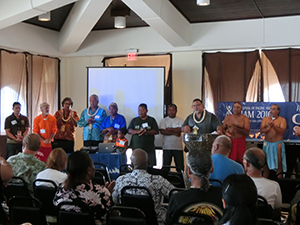 In addition, plans and systems to protect them are not yet adequate, so it indicates that Nan Madol will still need the assistance and cooperation of a large number of experts in the future. On April 25, 2015, an earthquake occurred measuring 7.8 on the Richter scale centered in Middle Nepal, tremendously damaging a wide area, including the capital Kathmandu, together with many cultural heritages. In this investigation, we held discussions with major institutions involved in the protection of the historical heritage, including the Nepalese Ministry of Culture, Tourism and Civil Aviation, and the UNESCO Office in Kathmandu. We also conducted a field survey by visiting the old royal palaces in Kathmandu, Patan and Bhaktapur listed as World Heritage Sites, as well as Sankhu, Kirtipur, Khokana and other suburban villages included in the Tentative List. Then, we examined the properties and areas subject to the full-scale investigation to come, as well as its approach. 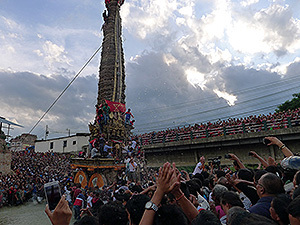 In addition, we had a good opportunity to observe Indra Jatra, the largest festival in Kathmandu, where Kumari as a Living Goddess paraded with a chariot, and Bara Barse Jatra, a festival held every 12 years, which had been suspended due to the earthquake disaster. We felt that these festivals worked as incentives to re-create ties among the people at this time of reconstruction. Under this project, in cooperation with other institutions and universities in Japan, we will study proper protection and conservation approaches for the damaged cultural assets through multifaceted research on “traditional building techniques,” “structural planning,” “urban design” and “intangible cultural heritage.” Based on this research, we will technically support the authorities in Nepal to preserve the value of the cultural heritage during the reconstruction process to be promoted rapidly from now.